These policies only apply to PSYC 3889 (Undergraduate Research), PSYC 3899 (Independent Study), and PSYC 4197W (Senior Thesis in Psychology) and should be used in conjunction with University and CLAS policies. None of the following apply to PSYC 3880 (Field Experience). Available PSYC 3889 positions may be self-posted on the designated bulletin board outside of the Undergraduate Program Office. Posted flyers must contain the name of the lab’s faculty supervisor; non-compliant flyers will be removed. At this time, there is not a dedicated website for posting such positions. Positions may be advertised via an announcement on our website and/or in the Undergraduate Psychological Sciences Digest by emailing the Undergraduate Program Office. Psychological Sciences faculty will be allowed to simply issue a permission number [View Tutorial] directly to students registering for PSYC 3889, 3899, and 4197W. 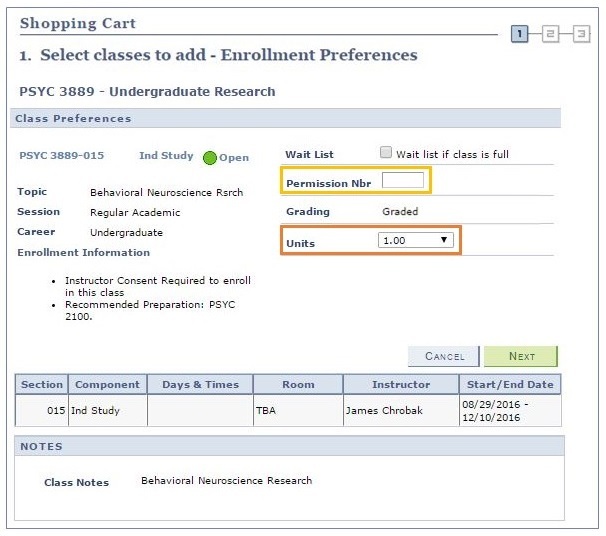 To enroll, students must search for the course and select the appropriate section from 75+ sections in the Student Administration System (i.e., PeopleSoft). Faculty need to ensure that graduate students or research assistants transparently identify their faculty supervisor and tell students the section number in which they should enroll. Both the permission number and the section number can be obtained from the same page in the Student Administration System. If a student enrolls with a permission number (yellow box), they also need to adjust the number of credits (orange box). Critical information can be obtained from the Student Administration System (i.e., PeopleSoft): Faculty Schedule > My Schedule. Enrollment with a permission number is only possible when registration is open to the student in the Student Administration System (i.e., PeopleSoft). Once the Add/Drop period ends after the 2nd week of the semester, students cannot enroll with a permission number and must instead use the Research Form (i.e., Independent Study Authorization). Or, faculty may request a permanent title be added to their section by emailing the Undergraduate Program Office. Once added, this permanent title will automatically roll over into future semesters and be automatically added to every student’s transcript. Faculty should not issue a permission number and also have the student complete the Independent Study Authorization. It is only one or the other. Using both a permission number and the form can result in the student being “double-enrolled” in the course for twice the desired number of credits. Should this occur, the faculty must follow the steps outlined above for correcting the number of credits. Since the Undergraduate Program Office no longer uses the Research Learning Agreement, they created the Psychological Sciences Research Learning Agreement for personal faculty use as a syllabus or agreement. Use of the form is entirely optional and will remain between the faculty and the student. We encourage faculty and student to discuss in advance the requirements, policies, and grading of PSYC 3889, 3899, and 4197W coursework. The Undergraduate Program Office would be delighted to offer insight and advice in this regard. In short, faculty may have the student complete the form and keep the form as a syllabus or agreement at their discretion. Students enrolling with the form instead of permission number now only need to complete the Research Form (i.e., Independent Study Authorization). Additionally, only the instructor’s signature is required. The advisor’s signature and department head’s signature is not needed. Students will still submit the forms to the Undergraduate Program Office for these signatures, final processing, and enrollment. The the Research Form (i.e., Independent Study Authorization) must be submitted to the Undergraduate Program Office by the end of the 4th week of classes, after which processing requires a signature from the Dean (via the CLAS Academic Service Center). After the deadline, the student will be required to obtain the signatures of the Advisor, Instructor, Associate Department Head, and Dean, and then take the form to the registrar’s office. The Undergraduate Program Office will not process forms received after the deadline. Instead of tracking the activities of PSYC 3889 students with the paper Psychological Sciences Research Learning Agreement, the Undergraduate Program Office will use an online Qualtrics Survey. Late-semester (after the 10th week of the semester), the Undergraduate Program Office will email each PSYC 3889, 3899, and 4197W student a link to an online Qualtrics evaluation. Students not completing the survey promptly (one week) will be re-notified. Composite data concerning results of online survey data will be maintained by Undergraduate Program Office and provided to faculty sponsors and the Department Head.